Bill Wiese had a successful real estate career spanning over thirty-five years-through both good and tough economic times. Early in his career, he made the decision to carefully study the Bible and apply God's methods to every move that he made. As a result, he attained success that was unheard of for many other agents, simply because he adhered to God's plan. 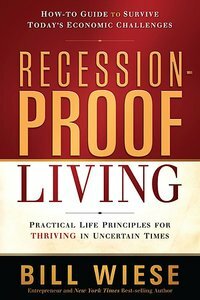 InRecession-Proof Living, he shares these biblical principles along with true stories of his experiences to demonstrate how anyone can achieve success-spiritually, financially, physically, and corporately-by living according to God's economic system. Not simply a book about how to make money,Recession-Proof Livingshows you how to live a life that guarantees success-God's way. Even if every effort and method you've tried has failed, living by God's standard won't. Bill Wiese is the New York Times best-selling author of 23 Minutes in Hell. He has been a dedicated Christian and has served in various capacities including teaching and leading worship since 1970. He has appeared on several television and radio shows and is an accomplished speaker. Bill is a successful Realtor with over thirty years of experience. He lives with his wife, Annette, in Southern California. chapter Twelve—wisdom: How Do We Obtain It?